A number of our branches have shared pictures of their ancestors with us. We decided to publish them here, for all of us to enjoy. Any of them look like a cousin, uncle? They could be closer relatives than you think. A Civil War photo of Wilhelm Braatz and other photos of his descendants, provided my Melvin Clark and assembled by Ned Braatz. 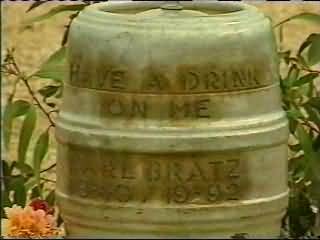 Inscription says: "Have A Drink On Me" "Karl Bratz" "1940 / 1992"